Order yours for just $27.00! 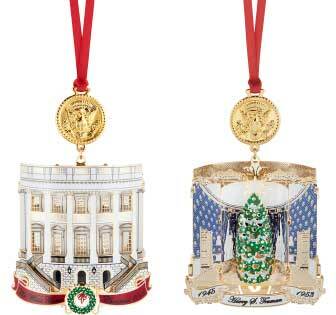 The White House Historical Association’s 2018 White House Christmas Ornament honors Harry S. Truman, the thirty-third president of the United States. This ornament is designed to illustrate three significant changes made by President Truman during his administration, one to the Presidential Seal, and two to the White House itself. One side of the ornament features his celebrated Truman Balcony, added in 1947–48 to the South Portico, and the other side features his renovated Blue Room, which, like all the rooms of the house, was dismantled and rebuilt during the renovation of 1948–52. These two images represent Truman’s White House alterations and restorations, the most extensive work on the house since President George Washington built it in the nation’s dawning and Presidents James Madison and James Monroe restored it after the fire in the War of 1812. The Presidential Seal featured at the top of the ornament reflects the design as changed by Truman. Originally the American eagle looked toward its left talons, which hold a cluster of spears, weapons of war. Truman, in the autumn after he took office, had the seal redesigned, turning the eagle’s head away from the spears to its right talons, which hold the olive branches of peace. To order the ornament ($27.00) and have it shipped to you, please click the button below. A $5.95 shipping charge will be added to your order. To order the ornament ($27.00) and pick it up in person at the monthly meeting, please click the button below. To order the ornament ($27.00) by mail, please click the button below to download the order form. Please fill out the form and mail it to the address listed on the form.